Sister Sax wedding & party entertainment in Essex - Testimonials. Recommendations, customer reviews. Below are some very kind words from just a few of our many customers. See the Sister Sax Facebook page for the very latest reviews and comments. 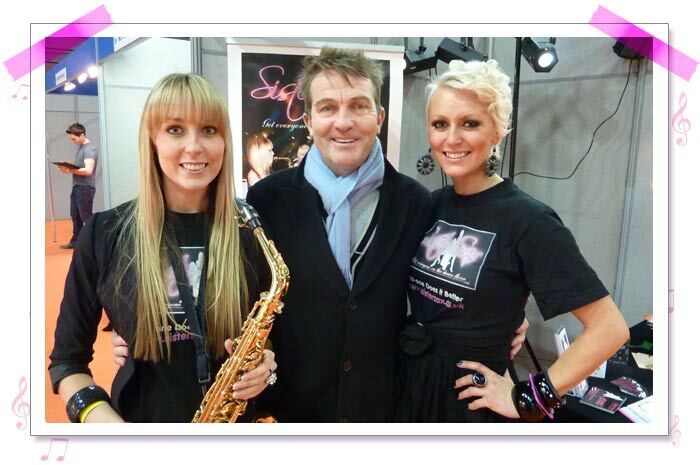 Bradley Walsh - "Great show girls, lovely singing and loved the Sax!" Sister Sax (Kay) was highly recommended for her performance and after checking her out on her website we quickly booked her to play at our wedding festival, which was a few weeks ago now. Kay was so helpful and accommodating to our ideas on the lead up to our big day, and her enthusiasm for the event was fantastic! Her organisation and professionalism was brilliant, so we were totally confident in her for the big day. On our wedding day, Kay was our opening act, greeting our guests with the perfect choice of tunes. She continued to play throughout our meal and sounded faultless, both on sax and vocals. As the day went on, she built up the pace to get all our guests into a great party mode! Kay totally rocked the festival look, and she gave off great vibes - we loved her and so did all our guests! We couldn't have asked for more, thank you Kay for making our day extra special. We booked Sister Sax for our wedding in August this year for the WHOLE day and I just can't put into words how incredible she was! We had the Saxophone, vocals and DJ-ing - the most talented woman, who fitted into our wedding party just like one of our friends. The constant communication before the big day from Kay was great, really made us feel at ease and she had everything under control to make sure our day had the best entertainment possible - she blew us all out of the water!!! I would highly recommend Sister Sax and will defiantly be booking her at any other events we have in the future!! Sister Sax were so amazing at my wedding last Novemeber. It was the perfect ending to our ceremony when they performed "Signed, Sealed, Delivered", one of our favorite songs. I will never forget how special SisterSax are, they were the perfect "finishing touch" to our special day. The entire set list played was superbly and beautifully performed and certainly got everyone in to the party spirit! A real big thank you for a great time on Friday. The wedding music was brilliant. There were a few people who took your cards so I hope you get a bit more business. All the best for the future. Thank you so much for playing at my party on Saturday - as usual you were fab and everybody thought so. You really were the icing on the cake! Well, many many thanks once again and I will definitely be booking you both again for any future parties and highly recommending you to friends/family. Bob and I just wanted to thank you both so much for your performance at our daughter's wedding on Saturday it was absolutely brilliant. I was the lady jigging about all the time and unable to keep my feet still despite being outside. I know you were freezing standing in that spot all afternoon the wind was very cold and your hands were like icicles but you could not tell by your excellent show. I will be passing your cards to all I know who put on live music with a very strong recommendation from myself and loads of my friends. Thank you once again for making Pat and Clare's day so very special. What a wonderful night! Thank you very much for making the night run smoothly. You guys are great! Should anyone ask I will happily recommend Sistersax. Anyway thanks again. You were both brilliant. Just a quick note to thank you once again for making our Silver wedding anniversary and birthday celebration a night to remember. You were just fantastic and all my guests have been raving about you! Keep playing and doing what you do and I am sure we will see you again. A big thank you to you and Victoria for yet again a fantastic night it was unbelievable. I knew you were good having heard you play at our daughters wedding but we didn't realise you were THAT good. You played for such a long time with hardly a break and so versatile too. I have never seen so many people crammed into such a tiny room dancing the night away. You created such atmosphere and everyone had a brilliant time. I still can't believe you could play and sing the variety of music you did so effortlessly all night (well that's the way it looked) and thank you for joining in the party with your halloween outfits it just made the whole evening that much more special. Ever thought of going on X factor....... we would vote for you! I have passed your cards onto the Marque man who says he is often asked for recommendations and after the way i went on about you he was in no doubt that you were good. I am sure that is not our last party so please don't forget us. We will continue to look at your website and make a point of catching up with you when you play locally. CLS employed Sister Sax to perform live music for a corporate function that we held late in 2009. Sister Sax did not need advising of what to play as they fully understood what a corporate business event required. Having left the music in their capable hands, they not only surpassed our expectations but also those of our clients who in turn asked for contact details so they could book their services for their own events, a testament to the professionalism of SisterSax. A very professional performance indeed. Great meeting you both at Brentwood over the weekend, I think your duo/trio is brilliant, well done. If I get any live entertainment requests in future I'd be happy to refer them to you. Joanne Bailey - 'Kay and Victoria were so amazing at our charity event last night. Everyone commented on you and asked how I managed to find such a gem! I recommend the girls to anyone looking for entertainment. Thank you so much for such an amazing evening. Mum really enjoyed herself and so did all her friends. You were both fantastic and really made Mums 60th a night to remember - Thank you so much... We'll recommend you to every one we know. Thanks from all the members from Upminster Golf Club who attended our 'SisterSax' function we had in June. The night was a great success due to the entertainment, you were excellent! I have recommended you to several people and others have asked for your details, we wish you every success and look forward to hearing you again. Little Angles Dance Acadamy, Wickford. "I've had so many lovely comments from parents etc from the disco you provided for our awards ceremony on Saturday night. You helped make it all happen so thank you very much. We will use you every year from now on!" Lovely to meet you both too - so sorry I couldn't stay longer. You were both excellent from what I saw and will definitely continue recommending you! Very happy to have you with us on NYE 2010 ! x"
I am writing to thank you for playing at my charity ball on Saturday 2nd April 2011 in the Courtyard Suite, The Rivenhall Hotel. The evening went extremely well and we raised just over £1,000 for my charities this year which are the RNLI, the Essex Air Ambulance and the Maldon Pioneers. The sets you played were perfect for the evening and although not many people danced at first, as the rhythm increased it was pleasing to see that the dance floor filled! Thank you both once again for your support and I hope you thought that the evening was a success. Many thanks for the superb show you and your uncle Max Bedford put on for the SWANS Grace & Style Ball at Crabbs Barn on 12th November. We were very pleased with the set and the songs chosen as I don't believe the dance floor was empty from the moment you started to sing to the end! With regards to dealing with you before the event, we would like to say that contacting you and keeping in touch was extremely easy and that all issues were dealt with swiftly and successfully. We would have no hesitation in recommending you. "I can't thank sister sax enough for playing on our special day, the girls have the balance of professional and friendly down to a tee. Kays voice is sensational and we have had so many people asking about the girls we are more than happy to recommend them." Sistersax were absolutely fantastic for our patients' Christmas party in December 2012. Their music was up to date and really got the crowd going. Vocally and musically they were both very talented. Aside from that they accommodated our last minute requests very well and were very adaptable. We would definitely be booking them again for future events. Hi Kay, Thanks for a fantastic entertaining evening it was great to meet you, we have had a lot of positive feed back from the club and hope to create a lot more events with them in future. With great acts like yourselves i'm sure the reputation and popularity of the club will grow. We look forward to working with you in the future. We really enjoyed the day and everyone has been telling us how much they enjoyed your music. Please let us know where you are playing in the future as we love coming to listen to Sister Sax! Thank you for helping us celebrate our party at Greenwoods. We thoroughly enjoyed the evening and hopefully you had a good time too. Please would you thank Ellie as well. Also thank you for the photo's and video's you took. Thanks for the email and for sending through some photos, that was really nice of you - as we weren't taking photos ourselves its great to see what other people have taken. A big thank you too of course to both you and Ellie for playing for us on the day. We really appreciate the hard work and effort that went in to making it all look so effortless! The sounds of the saxophone on the terrace after the church created exactly the atmosphere that we were after, in the perfect setting, and we had lots of lovely comments, which I'm glad to hear that people shared directly with you too. It was great to get people up and dancing in the evening too, as you say everyone had a great time - I guess only the best parties end up doing the conga! We really had an amazing day so thanks again for being part of it. Huge thanks to you guys for such a wonderful performance at our wedding Friday. All the guests commented on you, how great it was and how you got the crowd going. Amazingly adaptable throughout all the different parts of the day. Highly recommended! Xxxx you rock!!! !